Cyclosorus falcilobus (Hook.) Panigrahi, Res. J. Pl. Environ. 9: 66. 1993. – Lastrea falciloba Hook., J. Bot. 9: 337. 1857. – Lastrea calcarata var. 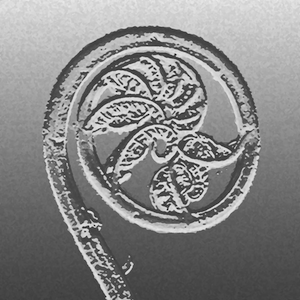 falciloba (Hook.) C.B.Clarke, Trans. Linn. Soc. London, Bot. 1: 516. 1880; Bedd., Handb. Ferns Brit. India: 237. 1883. – Thelypteris falciloba (Hook.) Ching, Bull. Fan Mem. Inst. Biol. 6: 298. 1936; Tardieu & C.Chr., Fl. Indo-Chine 7(2): 358. 1941; Tagawa & K.Iwats., Acta Phytotax. Geobot. 23: 49. 1968; Tagawa & K.Iwats., Fl. Thailand 3: 422. 1988; Boonkerd & Pollawatn, Pterid. Thailand: 230. 2000. Thelypteris esquirolii auct. non (Christ) Ching: Mitsuta, Acta Phytotax. Geobot. 36: 148. 1985. Rhizome short, erect; scales up to 4 by 2 mm, pale brown, thin, hairy at margin. Stipes up to 30 cm long, with reduced pinnae nearly to base. Laminae oblong-lanceolate, acute at apex, up to 44.5 by 21.5 cm, 17–28 pairs of full sized primary pinnae; lower pinnae reduced to mere auricles, middle pinnae linear-lanceolate, gradually narrowing towards long-acuminate apex, cuneate at sessile base, 6.5–17 by 1–1.5 cm, deeply lobed nearly towards costa; segments falcate, oblique, forming angle of 35°–45° between costa and costule, acute at apex, entire and often involute; softly chartaceous, green, pubescent on undersurface; veins pinnate, veinlets simple, hairy, basal anterior ones running to callous-membrane in sinus between segments. Sori round, medial; indusia persistent, glandular . NORTHERN: Mae Hong Son, Chiang Mai, Chiang Rai, Phitsanulok; NORTH-EASTERN: Phetchabun. India (Assam), Upper Burma, SW & S China, and Vietnam. Terrestrial near streams in shade at medium altitudes. Middleton et al. 4968, Mae Hong Son, Mok Cham Pae (E); Hansen et al. 10956, Chiang Mai, Huey Na (K); Middleton et al. 5106, Phitsanulok, Rom Klao (E); Boonkerd 1707, Phetchabun, Nam Nao National Park (K).